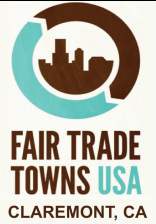 Fair Trade Claremont is a coalition of citizens, businesses, civic groups, schools and faith communities working to increase understanding, availability, and use of Fair Trade products as a means to reduce poverty, improve lives, and protect the planet. Fair Trade is about trade--not aid-- and is a sustainable way forward. Fair Trade is consumer driven and is a practical and effective way to make globalization work for everyone. In April of 2012 Claremont officially became the 28th Fair Trade Town in the United States and joined more than 1,000 cities and towns across the globe in the growing movement to make Fair Trade the new normal in everyday shopping. At the WHERE TO BUY tab locate Fair Trade in the area.